Every artist has heroes. Heroes who made the art they loved as a younger person that inspired them to make their own art. For me as a young songwriter, the list was pretty long: Tom Waits, Tom Petty, Bob Dylan, Patty Griffin, Ryan Adams, Willie Nelson, Marvin Gaye, Johnny Cash, Townes Van Zandt, and many others. By the time I got around to having my own fans, a lot of my idols had passed away. A few years ago, my manager and booking agent had me make a dream list of artists I would love to open for. On the top of my list was Willie Nelson. In November of 2017, that dream came true. Almost every singer and songwriter alive today would put Willie Nelson on their Mount Rushmore of living legends. I have been a huge fan of Willie’s since I was in college. I love his jazz singing, his inimitable songwriting, the loyalty of his band and family, his deep love of his home state of Texas, and the way he never stops touring. My wife Ellie and I saw him for the first time at Farm Aid in 2005, then again with BB King down on the Gulf Coast, and every time if feels like a family reunion. With his sister on keys for nearly half a century, and mostly the same band members since he was a kid, it really is “making music with my friends” for Willie Nelson. So, when I got the call that Willie had invited us to do a 10 day tour with him, I was speechless. Not only did we get to tour with him, we decided to take the whole family. The first show was at the historic and infamous honky tonk Billy Bob’s, in Fort Worth. Then we made a big circle through Arkansas, Mississippi, Louisiana, Oklahoma, and back to Texas. We played honky tonks, regional small town theatres, casinos, and and an arena in Houston, a little taste of everything. No matter the room, everyone adores Willie Nelson. They sing along to his songbook of American classics, and even at 84 he was still able to stand on his feet the whole time and give the audience a glimpse of his legend. Since he’s in his mid-80s, we were told by his band and crew that getting to spend time with him would probably be short and sweet, but they would do their best to make it happen. About halfway through the tour, they told me he wanted me to come up and sing with him that night. I got to sing onstage with him three of the next five nights of the tour, singing harmonies to “Will the Circle Be Unbroken,” “I’ll Fly Away,” and “I Saw The Light.” It was a thrill. My final memory from the tour was after our last show with him. 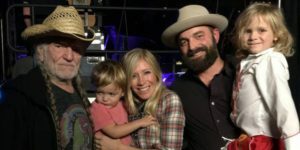 We decided to let our 5 year old daughter, Emmylou, stay up late and watch Willie’s entire set sidestage. After watching me sing with him for the last time, the band was still playing and Willie was shaking hands and signing posters and bandanas at the front of the stage. My wife Ellie was holding Emmylou, and as Willie walked offstage, he stopped, gave Emmylou a kiss on the cheek and says, “Goodnight princess.” Of course, she might not remember this when she is older but it is a moment we will remind her about for the rest of our lives. Being on the road with Willie left a big impression on me in a lot of ways. The loyalty of his crew and band made me want to be a better bandleader, and hopefully be the kind of person who deserves that sort of loyalty in our band. I dug deeper and deeper into his vast catalog and even found a heart-wrenching cover of The Muppets’ “Rainbow Connection” that I play to help our newborn son Rivers go to sleep at night. The older two kids have become accustomed to our vagabond troubadour lifestyle and “On the Road Again” is an anthem of sorts in our home and in our cars. So, in honor of those magical 10 days spent on the road with the living legend, and in honor of our kids, who have been strapped on to the backs of our dreams, we recorded our own version of “On the Road Again.” Nothing will ever have the magic of the original, but it feels good to give it our own spin. We hope you enjoy it. This entry was posted on Tuesday, January 22nd, 2019 at 2:51 pm and is filed under Albums, Fans. You can follow any responses to this entry through the RSS 2.0 feed. You can leave a response, or trackback from your own site.